On the news of the passing of The Most Honourable Sir Howard Cooke, Former Governor General of Jamaica, last Friday, July 11, 2014, the National Democratic Movement has paid tribute to his life and contribution to nation building. 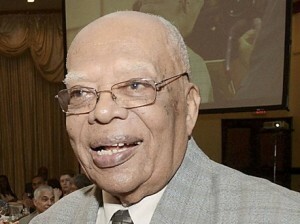 The Movement reiterated that this is the end of an era and hailed Sir Howard as an outstanding son of Jamaica from whose life of service and selfless leadership Jamaica has benefited tremendously and thanked him for the Indelible mark which he has left upon the life of Jamaica. The Movement further extended condolences to the family of the late GG and calls on all Jamaicans to include them in their prayers at this time.